So you have found one or even a few residencies that you would like to apply for. Now you have to stand out from the crowd. You need a way to make your application prominent — which has nothing to do with how pretty the font is. Here are some ideas that might help. 1. Research artists who have previously been to that residency. Look at as many as you can. What is similar about these artists? Do they all create new, very unique work? Do they focus on conceptual ideas? Is the work large or small? Do they focus on technique? Why do this? Because you want to present work that is in keeping with or is a good fit for this residency. By that I don’t mean that you should change what you do, but you want to carefully select images of your work that relate to the residency. Since you were attracted to a specific residency, it probably already suits what you do. But be strategic about the images you include in your application. 2. Have professional photos taken. I can’t stress this enough. If you are not able to take them yourself, get a photographer to help. If your work is two-dimensional, make sure the images are square and no frames are in the image. Take the photographs in natural light for the best effect. If your work is three-dimensional, use a plain neutral background and make sure the work is well lit. You'll also want a good headshot with your work in the background, and an image of you at work. Some residencies, especially in Asia, do require a headshot. If the added expense is an issue, get creative. For example, I swapped an artwork for a photo shoot and we were both happy. Now I have learnt how to take great photos and can do it myself. Aim to have 5 to 10 great images. 3. Write an artist statement. Many of us (myself included) hate writing these, but they are usually required for residency applications. An artist statement is basically just a general introduction to your work: a couple paragraphs about your work's basic concept and how those concepts are presented in the artwork. Be genuine and don’t use too much over-the-top art talk. (You all know what I mean.) Look up the statements of some of your favourite artists to get ideas for how you might approach your own. Almost all residency applications want to know what you plan to do. This is where you can stand out. Be sure to check if there is a theme or idea that you are required to address. These are usually very broad and can easily be adapted to any artwork you create. Your proposal should be realistic about what you can achieve in the time you have. You are not expected to work 24/7. Stick with what you know, as materials and equipment can be quite different in a foreign country. Always factor in time for exploration and design. Experience has taught me to allow the place I am in to influence my creative process, so my work at each residency has changed and evolved over time. This has been such a valuable way to avoid stagnating as an artist. Be specific in your proposal. Instead of saying 'I want to create a new body of work', say 'I want to create three large sculptures (approx. 50 cm each) and a range of smaller sculptures inspired by the textural qualities of French architecture.' This is vague enough to allow you to create anything, but specific enough to give you focus. 5. Check your application for consistency. For example, your images should relate to your artist statement and your proposal. If you are not sure about anything on the application, email the residency and ask questions. Proofread, proofread and then proofread again. Then get someone else to proofread your application. 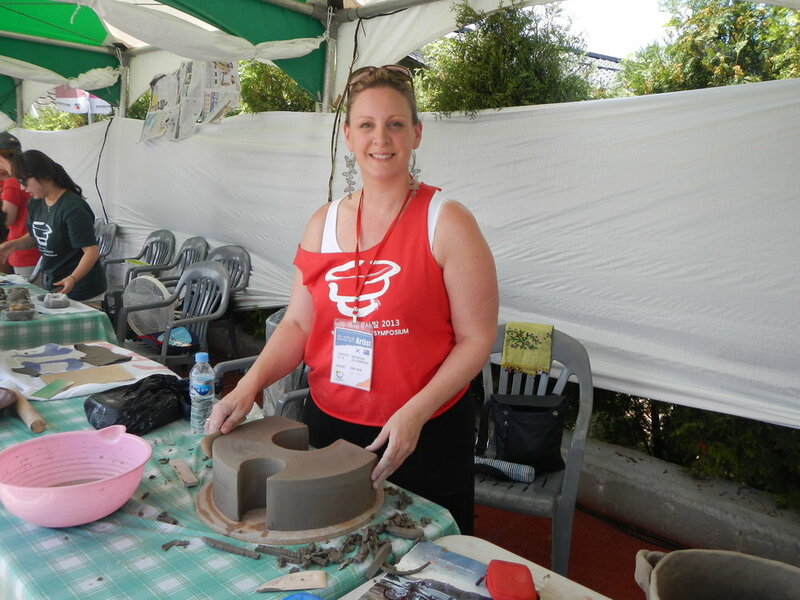 Sally Walk is a ceramic artist. She holds a Bachelor of Art (Ceramic Design) and a Post Grad Diploma of Education. She has been working in clay for more than thirty years and creates sculptural work in stoneware and porcelain clays. Sally has attended twelve ceramic art residencies all over the world and has held six solo exhibitions and more than thirty group exhibitions. She was selected to exhibit at the Tokyo Art Fair in Japan, Art Melbourne, and the Florence Biennale in Italy, where she was awarded the ‘Lorenzo il Magnifico’ first prize for ceramics. For more about Sally, visit her website or follow her on Instagram (@sally_walk).